You better watch out, you better not cry, you better not pout—you can see for yourself that he's coming to town. The presents are wrapped, the tree is up, and the stockings will soon be hung by the chimney with care. There’s only one thing left to do: track Santa’s annual Christmas Eve voyage around the world from your PC, smartphone, or tablet. This year Santa’s departure time depends on which version of the Santa-tracking fun you’re following. Check out our explanations below for all the details. It’s been 63 years since a misprinted telephone number in a newspaper ad led children in the Colorado Springs area to call NORAD predecessor CONAD, looking for Santa. Livestream: Starting at 2:01 a.m. Eastern December 24 (7:01 a.m. UTC), NORAD’s “Santa Cams” will begin tracking Santa on the NoradSanta.org website. Live phone call: Starting at 6:00 a.m. Eastern December 24, you can call NORAD for live updates on Santa’s progress. According to NORAD, more than 1,400 volunteers will answer the phones around the clock. That number: 1-877-HI-NORAD (1-877-446-6723). Email: You can email noradtrackssanta@outlook.com for the latest on Santa’s progress. YouTube: Follow the official NORAD Tracks Santa YouTube channel. Amazon Alexa: The NORAD Tracks Santa skill will let you ask Alexa for updates. 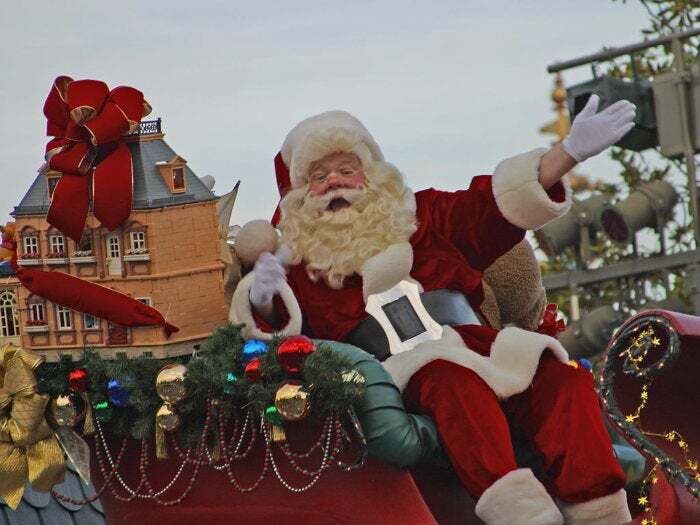 Search engine: Microsoft’s Bing search engine will be tracking Santa, too. Instagram: You’ll find a bunch of of NORAD Tracks Santa accounts on Instagram, but the biggest and most official appear to be @norad.santa, @noradsanta, and @noradtrackssanta_official. 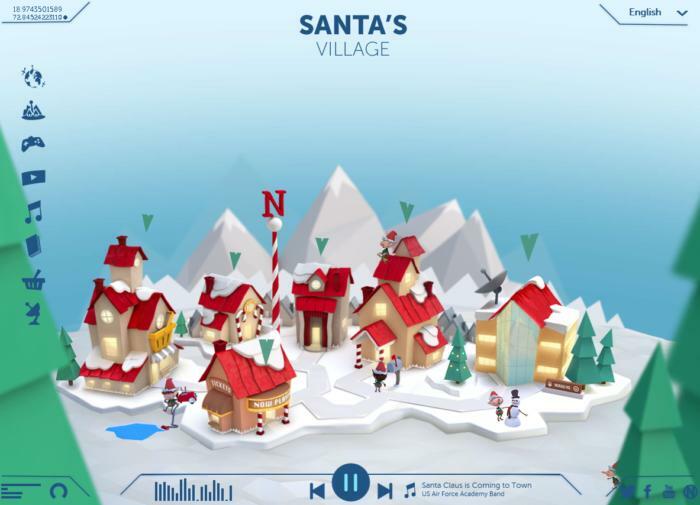 Google's Santa Tracker incorporates games and educational challenges with the holiday fun. 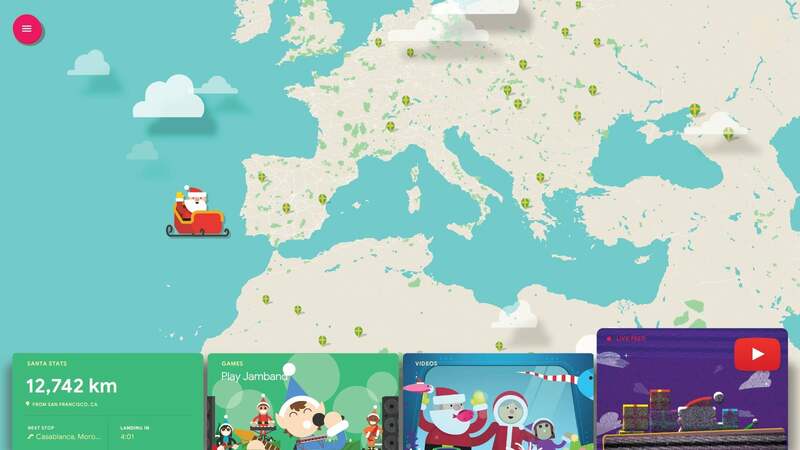 Google combines holiday fun with education on its Google Santa Tracker site. Google opened its online Santa’s Village on December 4, offering an array of games and challenges for kids of all ages, plus holiday Gboard stickers. You can also track Santa on Google Maps, starting around 10:00 a.m. UTC on Sunday, December 24, which is 5:00 a.m. Eastern. Beforehand you’ll see a countdown leading up to it. Track Santa on Google Maps starting December 24. If you don’t want to use Google’s website on your mobile device, the company is offering its annual Google Santa Tracker Android app. There are some Android app-exclusive games that you won’t find on the main website, as well as Android Wear support. Google has built Santa magic into Google Assistant. You can ask Google Assistant “Where’s Santa?” or “Track Santa,” or “tell me a holiday story.” Google Assistant also has some Santa-flavored jokes. When you ask the assistant “Tell me a Santa joke,” the Jolly Old Elf himself will make an appearance to tell some real groaners. I must admit I’m devastated that the Santa phone call novelty has been out of the lineup since 2016. This was my personal favorite holiday distraction, because it allowed you to send fun, Mad Libs-style phone calls from Santa to friends in the U.S. and Canada. I found Santa calls—while deliberately designed to be ridiculous—always brought a special smile to the recipients regardless of age. This story, "How to track Santa Claus on Christmas Eve: NORAD Santa Tracker, Google Santa Tracker" was originally published by PCWorld.